Álvaro Bisama’s Dead Stars (translated by Megan McDowell, e-copy courtesy of the publisher) is a novella in eighty-four brief chapters, and a story within a story. The book begins with two unnamed narrators having coffee in the city, waiting for offices to open (to let them get on with the business of dissolving their marriage…). Their plans are altered, however, when the woman opens the newspaper and sees a photograph of a woman she once knew – a woman who has just been arrested. In a time of caution and moderation, Javiera is a woman who makes no secret of her political leanings. Having suffered horribly under the previous regime, she’s determined to make herself heard, the one person who refuses to hide in the shadows. However, as mentioned above, while Javiera and Donoso dominate the story, we constantly return to our nameless, disillusioned couple. From the vantage point of their seats outside the café, they cast an eye back on a different time, the unexpected photograph in the paper reminding them of their own experiences (including depression and addictions). In many ways, the end of the marriage is a suitable metaphor for the crushing inertia felt in the country after the euphoria of a potential change of direction. In many ways, it’s a recital, an outpouring of memories, and the story of Javiera is representative of a communal need to release the suffering. The story is written in short, plain sentences for the most part, communicating the apathy felt after the draining oppression. With Chilean authors writing about the years of oppression, there’s always an elephant in the room, and there’s certainly a Bolaño influence, in themes if not in style. Of course, it would be hard for a Chilean writer not to mine that particular vein given the country’s recent history. 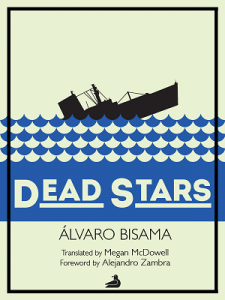 Dead Stars has a foreword by Alejandro Zambra, a Chilean writer, poet and literary critic, which touches on the era and looks at why the characters would feel and act the way they do. For most Anglophone readers, though, this is probably still not quite enough, and it might be a good idea to briefly look up the history of the era (Chile in the 1980s and 1990s). This sounds really interesting. It's to be hoped that digital publishing is a boon to literature in translation. Thanks for the post, Tony–hadn't heard of the author before, but the story sounds like something I'd enjoy and you say the style is even better! Does the work reference Chilean author José Donoso, by the way, or is that one character's name just a coincidence, do you think? Richard – I honestly couldn't tell you if there are any allusions as they would have gone right over my head anyway 😉 I have another story by Bisama in one of the collections I talked about above, so it'll be interesting to see if that's written in a similar style.